Natural stone tile greatly enhances the beauty of any home or commercial interior. Tiles made from marble, travertine, engineered stone or ceramic are very affordable when purchased in bulk and from a direct importer/distributor. Construction companies, floor product retailers, and even individual homeowners look for the best prices on stone tiles, and their aim is to find affordable product without sacrificing quality. Stonexchange offers premium quality tiles at the lowest possible wholesale prices. We are able to do this because we are the manufacturer as well as the importer and distributor. Based in Miami, Florida, our company distributes top-quality stone tiles throughout the nation, and our clients include retail merchants, home improvement stores, and construction subcontractors. Wholesale tumbled stone tile was once very difficult to purchase. The manufacturing process is quite detailed, and the tiles themselves are expensive to ship. This is especially true for those pieces fabricated overseas, near to the actual quarrying operations. Nalboor Tiles is the online wholesale showroom of Stonexchange, a leading importer of the finest quality tumbled tiles available anywhere. We import huge quantities of marble and travertine tiles and mosaics, and we offer the lowest per-piece price on full-crate or full-pallet orders. These tiles are popular for use in bathrooms, around fireplaces, and as part of an intricate kitchen backsplash design. Tumbled tile is somewhat rustic in appearance. This product does much to give the interior an authentic, ageless look. Because of the irregular shape of the individual tile squares, the placement patterns are quite varied, limited only to the imagination of the installer and customer. 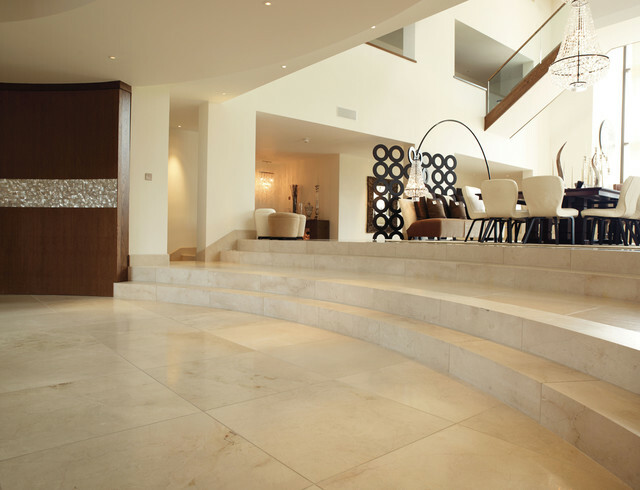 Marble and travertine are two of the most popular natural stones for use in residential or commercial interiors. Both are prized for their beauty, resistance to wear and tear, and overall durability. A property’s value increases dramatically when these natural stone products are included in the interior design. Tumbled tiles vary in size, from less than 1-inch square to blocks measuring 12″ X 12″ and containing six or eight individual pieces. Large sheets of marble or travertine are thinned down to a thickness of about 3/8-inch, are cut into individual squares, and sent to a tumbling machine. The stones are put through a light concussion or rotating tumble procedure that wears down the edges as well as the surface. The bottom surface is smoothed after the tumbling is complete. The rocks may be given a water seal treatment that not only makes them impervious to moisture percolation but also helps keep the color from fading. The individual stones are then placed as a mosaic pattern on a backing sheet or sold as a single piece. Most tumbled tile patterns have a small opening between the irregularly shaped stones. This is filled with grout or cement when the tiles are placed on the wall or floor. The result is a very rustic and very beautiful stone surface, one that requires little maintenance and adds natural beauty to the kitchen, bath, or living area. The Nalboor Tiles online showroom gives prospective customers an up-close and personal view of the popular tiles imported and distributed by Stonexchange. Our company specializes in the distribution of the most requested styles of tumbled natural stone, and we import these products in huge quantities. Because we own or part-own the manufacturing centers where these tiles are fabricated, we are able to offer the general public, flooring companies, and construction contractors the lowest possible price on top-quality marble and travertine tiles. Our products are ordered on a regular basis by our sales team. Huge containers of tumbled tile arrive via transatlantic vessel at our distribution center in Miami. Our company keeps a close watch on the sales numbers and responds accordingly with successive orders to ensure a full warehouse. This is good news for our clients, who enjoy not only the lowest wholesale prices on the market but also rapid order processing and delivery. We ship our tumbled stone tiles via overland freight to any deliverable address in the continental United States. Our service is extremely reliable, and our good reputation has been established through our understanding of our customers’ need for dependable order processing. We now invite all prospective new customers or retail merchants to take a close look at our product inventory. We think you will be pleased with what Stonexchange has to offer. Marble and travertine are the two most commonly used tumbled stone products. Stonexchange carries a wide assortment of both, each with its own sub-categories of styles and colors. These products are the highest grade of natural stone material found anywhere on the wholesale or retail market. As the name implies, Bianco Carrara is a white shade of marble streaked with faint grey. This is a very popular style of marble for home and office interiors. Bianco Carrara is often used as a kitchen backsplash to complement darker shades of marble used for the kitchen floor. It also looks fantastic when the kitchen is furnished with medium- or dark-shaded appliances. Crema Marfil is a popular cream/beige shade of marble tile, used extensively in kitchen, dining rooms, and baths. The tumbled stone tiles made from Crema Marfil are the perfect accompaniment. These tile arrangements complement the floor tiles and give the room an air of authenticity. Crema Marfil works well for any installation specifying Bursa or Botticcino. Emperador Light is a cream/mocha shade with lightly colored streak patterns. This shade offers a huge number of placement patterns, with the result being a truly unique, customized appearance. The individual squares vary slightly in color, meaning that no two patterns look exactly alike. Nero Marquina is a dark gray marble with thin white streaks. This is a popular shade for use as a covering for fireplace mantles as well as for kitchen backsplashes. The individual tile pieces making up the block vary in color, with some of the stones being very dark. Verde Luna is greenish in appearance, with moderate shade difference between the individual stones. The veins are rather wide and some of the stones have swirl patterns. This is a beautiful stone to complement lighter shades of tile used for the floor covering. Travertine is one of the most popular materials for wall coverings and kitchen backsplashes. Although it is rather porous, high-end travertine has been given a water sealant to keep it from absorbing moisture. Stonexchange carries all the popular color shades of tumbled travertine tile. Golden Sienna blocks contain both yellow and gold tiles. This stone lends a very bright yet somewhat calm look to the room. It is primarily used in kitchens and in the bathroom. Dark Noche is a very rustic-appearing tumbled travertine stone. The squares are rather uniform in color but have a wide variance in the streaking patterns. Noche is perfect for outdoor wall decorations as well as for kitchen backsplashes. Rose travertine is pink in color, with some streaking and mottling. It resembles red brick and is perfect for kitchen backsplashes, bathroom walls, and as a secondary accent shade on living room walls. Rose travertine is subtle in appearance and does not reflect a high amount of light. As previously stated, natural stone tiles are expensive unless ordered in bulk. However, even individual consumers can keep some extra money in their pocket when doing business with Stonexchange. Because we order large quantities of natural stone tiles throughout the entire calendar year, we offer fantastic wholesale prices on even smaller orders placed for tumbled stone tile. Contractors love dealing with us because we can mix-and match orders with little or no lead time required. A large construction project may involve the laying of floor surfaces in a good number of single-family homes or condominium units. Each of these units may have instructions for different shades of marble or travertine. This could be a real headache if the only purchasing option was from a retail outlet that did not keep a large supply of material in stock. Ordering direct from the importer is the smart alternative. We can finalize an order that includes each and every one of the shades and textures mentioned above. All interested parties – homeowners, contractors, and floor product retailers – are invited to look over the online product showroom at Nalboor Tile, the source for top-quality tumbled tile products from Stonexchange. Feel free to contact us with any questions regarding per-piece material pricing, order procedures, and delivery schedules. Start saving money today on the world’s finest tumbled tile made from the highest quality natural stone. Black tumbled tile with thin white veining. Has an antique look to it. Emperador light is composed of brown to mocha tones with thin creme colored veins.